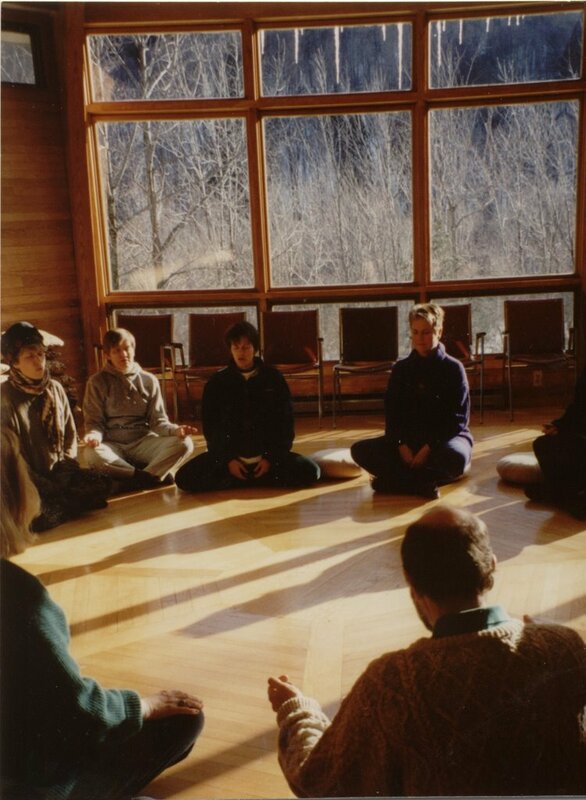 This 7 weekend intensives are spread over 8 months, March - October 2019, in which the 3 teachers will alternate weekend workshops, or teach in pairs. The 7th weekend is included for everyone as a bonus, or as a make-up session in case of inclement weather, or if you need to miss a session. The course is a self healing commitment and can not be attended part time. If you do need to miss sessions there will be no refunds. Ute’s Bamboo Studio in Pt.Pleasant, Pa.
near New Hope and Doylestown Pa.
We will reserve your place and send you confirmation, directions, and parking instructions after sign up. Also available 8 monthly payments of 175.- due by the first of the month. Reserve your space with a $100 non-refundable deposit, credited to your first payment. If you would like to book a session with any one of the teachers outside of the course, your first session will be discounted by 50% of their fee. Please don't hesitate to email with any further questions! We are born connected to a direct experience of the world through our body. As we grow, it’s easy to lose touch with our sense of wholeness, coherence, and even pleasure. Sensory Awareness is a practice of rediscovering our own resources for balance and connection. In this class we will be guided through sensory experiments to become deeply attuned and responsive to the felt sensations of gravity, our breath, energy and movement. In this way we can develop our capacity to embody greater ease, presence and authenticity. We will explore how our bodies are shaped by our long standing emotional and thinking patterns. The human body-mind is one integrated, coherent whole united by a matrix of energy conducting, vibrating, liquid crystalline filaments known by the humble term “Connective Tissue.” Also known as the fascial system network, it holds our bodies together, from head to toe, in the shape we recognize. We will watch a film showing the shape shifting powers of this remarkable tissue from within the live body. The Art of Intentional Listening and The Art of Allowing connect us to a Whole Self perspective and fluid support. We find comfort and love as we participate in our process of self healing. The approach of “Easeful Listening” (ease-fueled witnessing) is both common to Alexander’s work, Authentic Movement and Sound. With this refined awareness we are accessing our treasures that are already waiting within us, embody them more fully and create from our joy-filled humanness, alive and present. Zoana began her acting career as a member of “Bewegliches Teater” in Germany in the 70s, after attending the “LeCoq School of Movement and Improvisation” in Paris. After moving to the US she trained as an Alexander teacher in the early 80s in Philadelphia. She has been teaching and training AT for 35 years in the US and Europe. Zoana is a Reiki Master and Intuitive Synergistic Facilitator with a private practice in Mt.Airy Philadelphia. 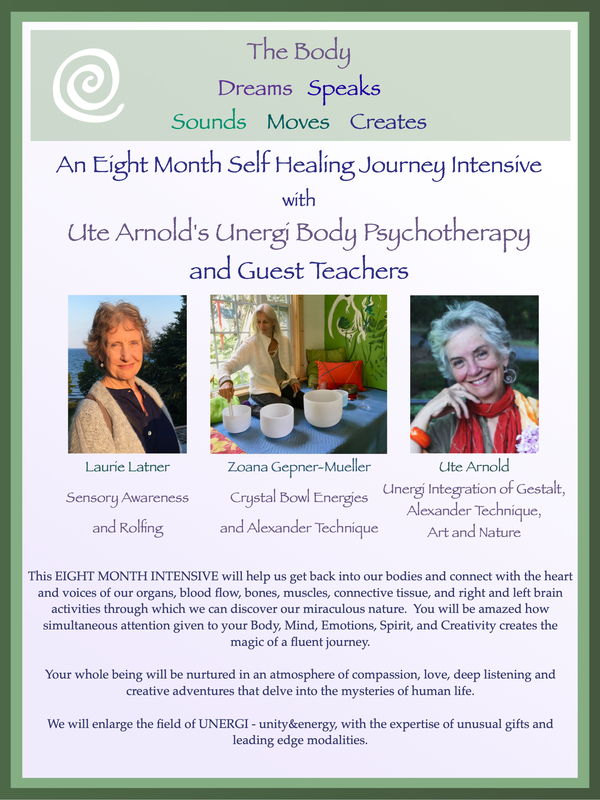 Ute Arnold will present her Unergi Body-Psychotherapy modality blending the Alexander technique’s sensitive listening touch, with body-dialogue using Gestalt therapy, and Unergi micro movements. This combination speaks directly into the body’s cellular memory and safely accesses deeply held emotions that are ready to be released. The result is a freedom of sensing, thinking, feeling which moves us into the lightness of being. Chakra Family Constellations will be included to reveal the journey of your family and tribe history. Ute will also use her many years of group art therapy experiments to remind our ‘early kids’ of the healing power of play, paint, collage ....today. Ute Arnold M.F.A. studied art, color and design in San Francisco and London in the 60s and 70s, Body- Psychotherapy, Gestalt Therapy and the Alexander technique in New York, Toronto and Philadelphia in the 80s and 90s. She finally combined it all when she opened her Unergi Body-Psychotherapy School in 1993, and has been teaching in her trainings, classes and private sessions ever since in Europe and the US. Her e-book STUCK is NOT a PLACE describes her own life’s journey, the UNERGI philosophy and how students and clients are experiencing UNERGI. Forward by Candace Pert P.h.D.